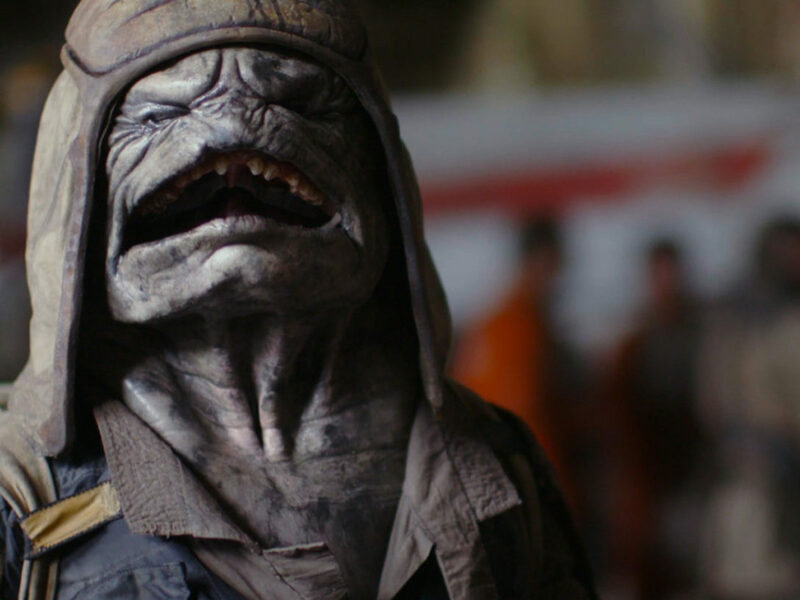 The legendary Star Wars designer discusses bringing the story of Rogue One to life. 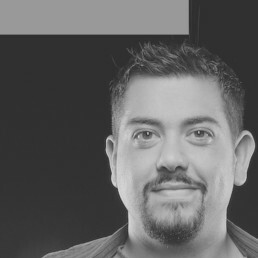 Doug Chiang is a legend of Star Wars and he’s been playing in that world as an artist for more than 20 years, working on the Special Editions, the prequels, and, now, the new generation of Star Wars films. 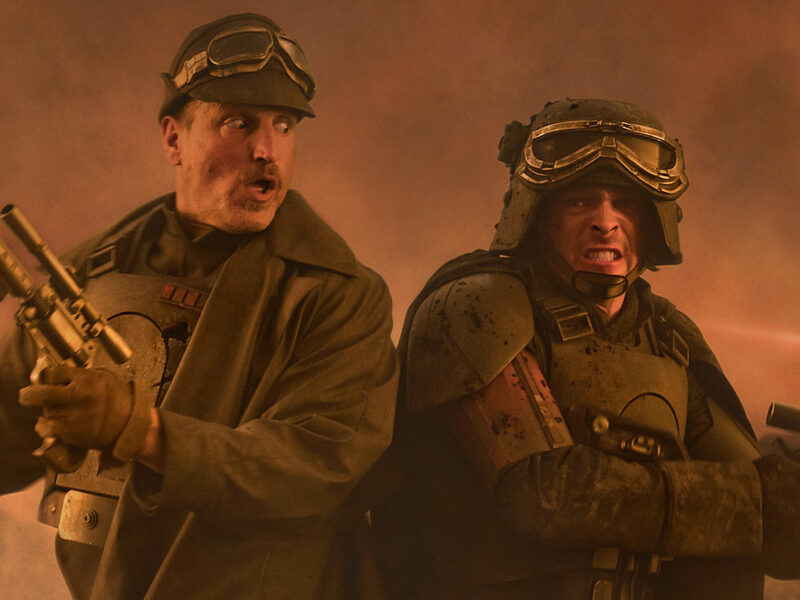 At Star Wars Celebration Orlando, he offered a presentation on the design of Rogue One: A Star Wars Story, and we were on the scene to take down the 10 most fascinating facts from the panel. 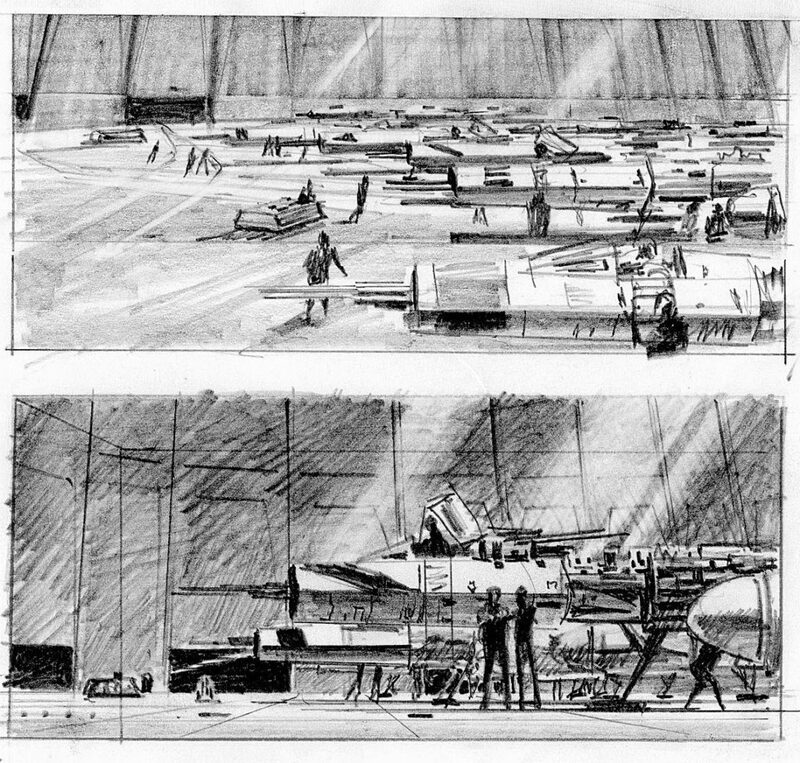 A Ralph McQuarrie sketch of a rebel hangar shown during the panel. 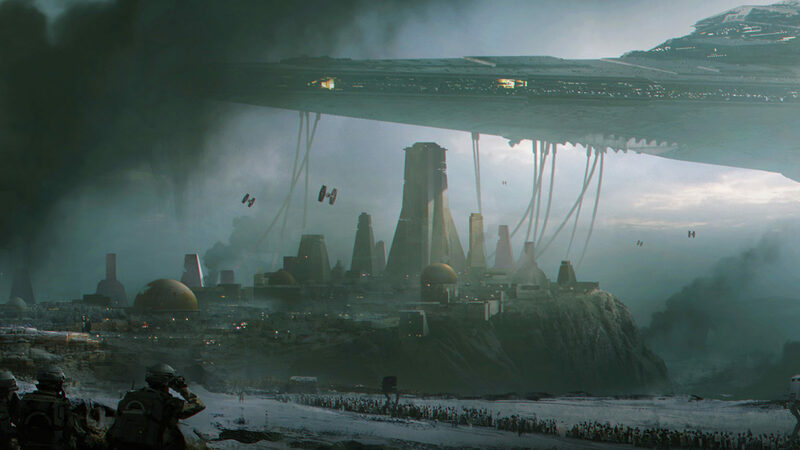 Concept art of the Imperial occupation of Jedha in Rogue One. 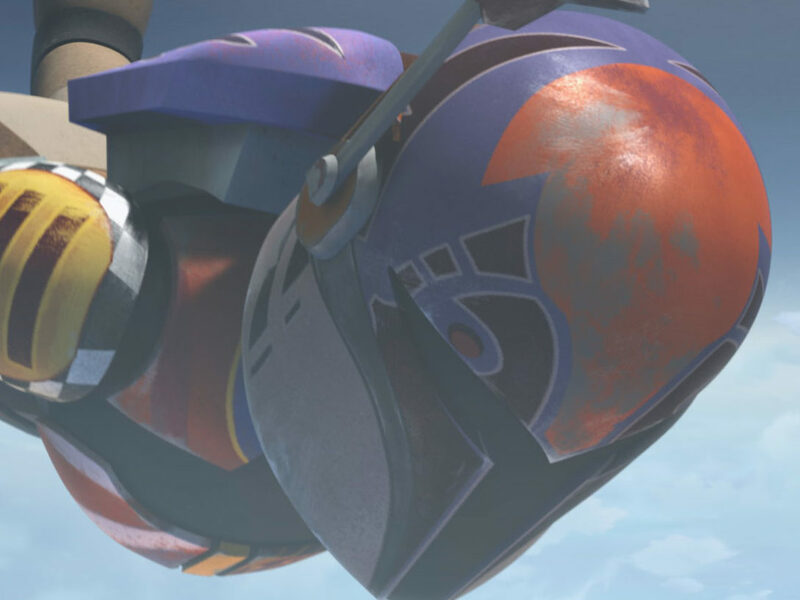 The U-wing went through many iterations before a final design was chosen. According to Chiang, they wanted to start big and the challenge was to make that 80% of their designs feel as though George Lucas had created them and built them and simply didn’t use them. 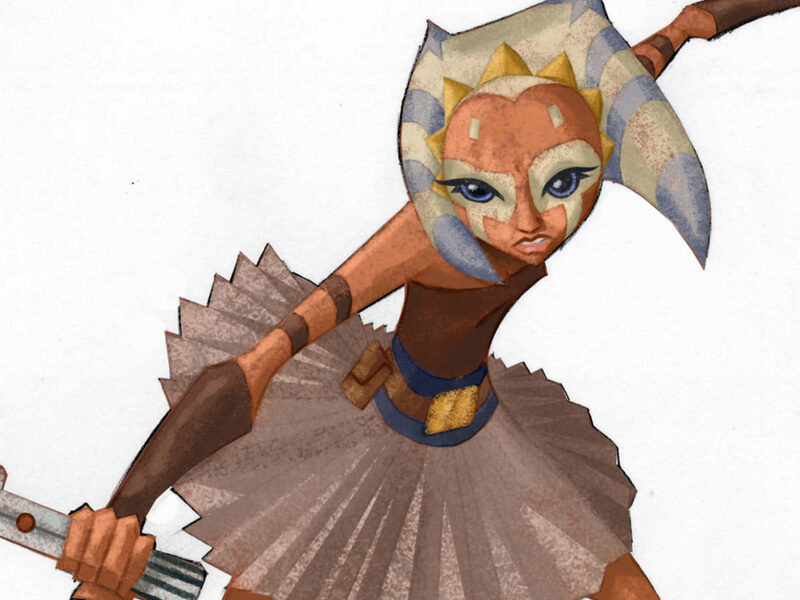 The other 20% would come from blending the prequel designs with a more handcrafted look. To design the U-wing (which went through 781 different drawings! 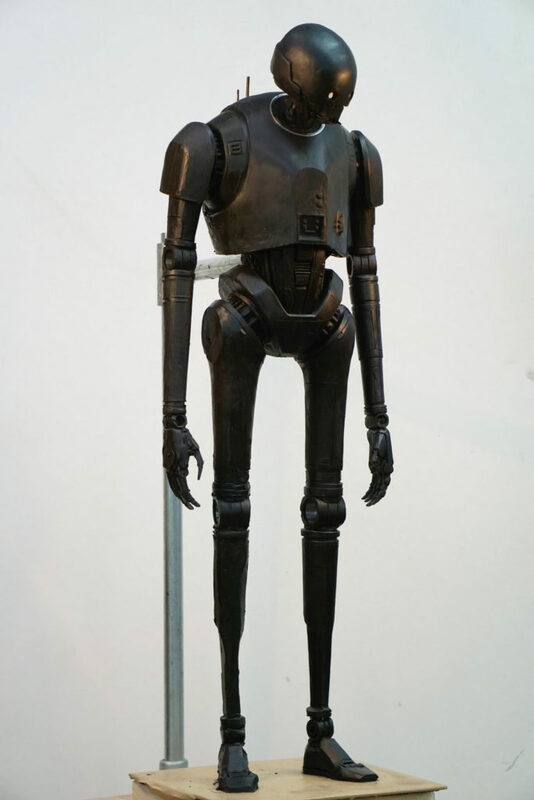 ), Chiang took Gareth Edwards up to the Lucasfilm archives to show him some of the designs they’d come up with for previous films. 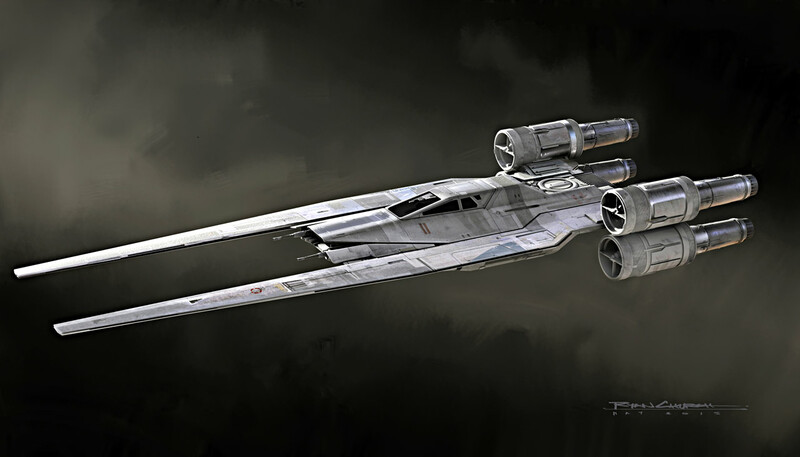 Edwards gravitated toward the looks based on an F1 Hydroplane, which shared design elements with Count Dooku’s solar sailer and Zam Wesell’s ship, helping bridge the looks between the dark times. 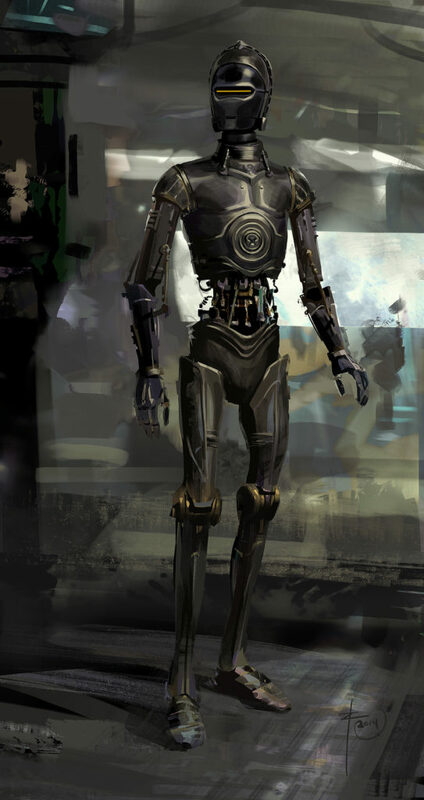 After that, they tried putting the head of an RA-7 droid on Kaytoo, and that design stuck around for a while, but it wasn’t right. Eventually, a member of the creature department, Luke Fisher, painted the distilled essence of what Kaytoo would be in a painting, which would be recognizable as the lovably sarcastic droid in the film. An early rendition of the Erso farm. 6. Ralph McQuarrie’s designs were the basis for the Erso homestead. 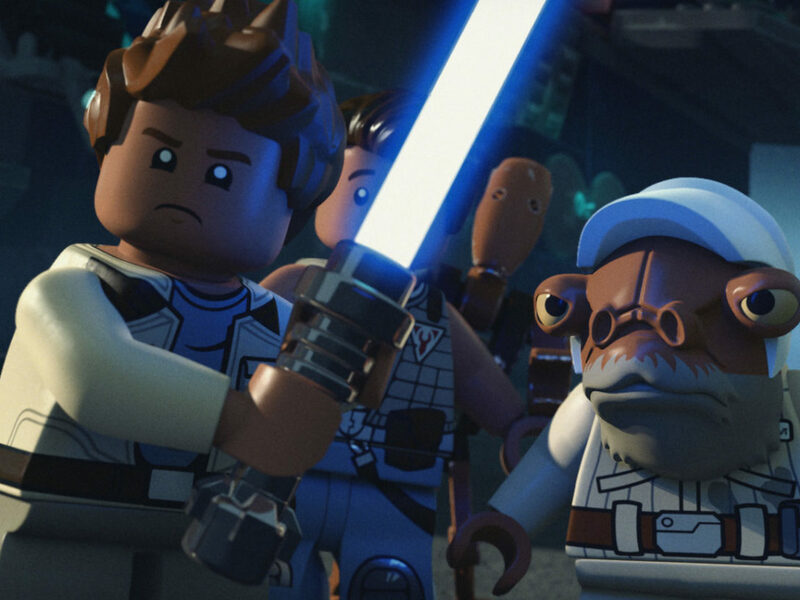 “The homestead was fun because we’ve never had a prologue sequence,” Chiang said, and to get the look right, they went straight to the work of Ralph McQuarrie. The first iterations of the Erso farm were based on the rock formations that look very much like Lothal on Star Wars Rebels. As the production designer, Chiang had to search high and low for places they could film their ideal for the design, and ended up in a couple of different places around the world. Ultimately, though, the decision was made by producers that the prologue would be filmed in Iceland, and they had to make due and, in Chiang’s estimation, it still turned out great. Concept art of Jedha and the Kyber temple. Through the entire design process, Chiang and the creatives behind Rogue One would ask themselves what the story reasons for the designs were. When it was suggested that Jedha City be on a cliff, they started asking what might do that. When it was suggested that the Empire was strip-mining something from the planet, they started asking why would they be doing so. When it was suggested that the center of the city would be a temple, they had to come up for a reason for that as well. How did it all come together? An asteroid. The Empire would be stripping Kyber crystals from the planet, which were holy to worshippers of the Force. And how did the Kyber crystals get there? The art team looked through pictures from NASA of the moon and other places and found that when an asteroid hits, it can create a plateau in the center of the impact crater. This asteroid would deliver the Kyber crystals, establish the city, and offer a compelling reason for a temple to be built. Then they started asking why the Empire would be there. And then they asked how they could create a focal center for the city, and that gave them the idea for how to lay out Jedha. Call it planetary planning. 8. Dantooine was going to be in the movie. 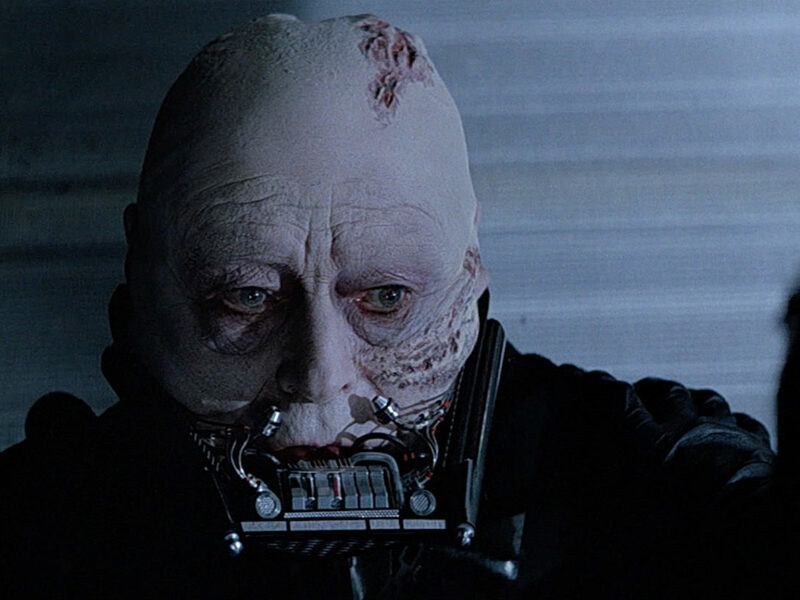 “I’ve always wanted to go back to Dantooine since it was referenced in Episode IV,” he said. And since Dantooine appeared in early versions of the script, Chiang would get his wish. 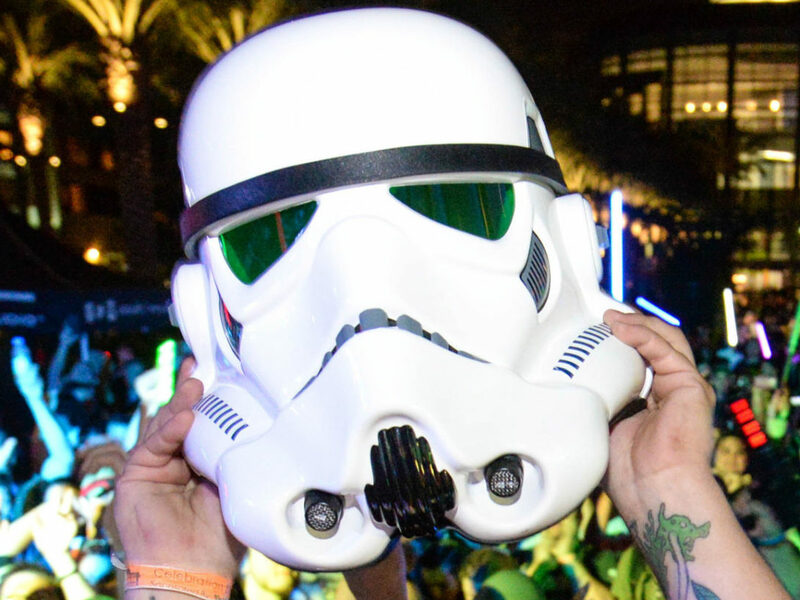 Chiang decided to steal elements of Echo Base from The Empire Strikes Back and put them in the design of the rebel base on Dantooine, thinking that these would be the same pieces of equipment that the rebels would carry with them to Hoth. Chiang and his team designed the interior of the base, scouted locations for it in Scotland, and then they found a perfect abandoned rock quarry in England — and then it was cut from the script. Yavin 4 and the rebel base would return in Rogue One. 9. Yavin 4: then and now. The hangars of the rebel base on Yavin 4 posed another problem for the production design team. They couldn’t use the stages at Pinewood studios because they were too small, so Chiang went back to what worked in the past. 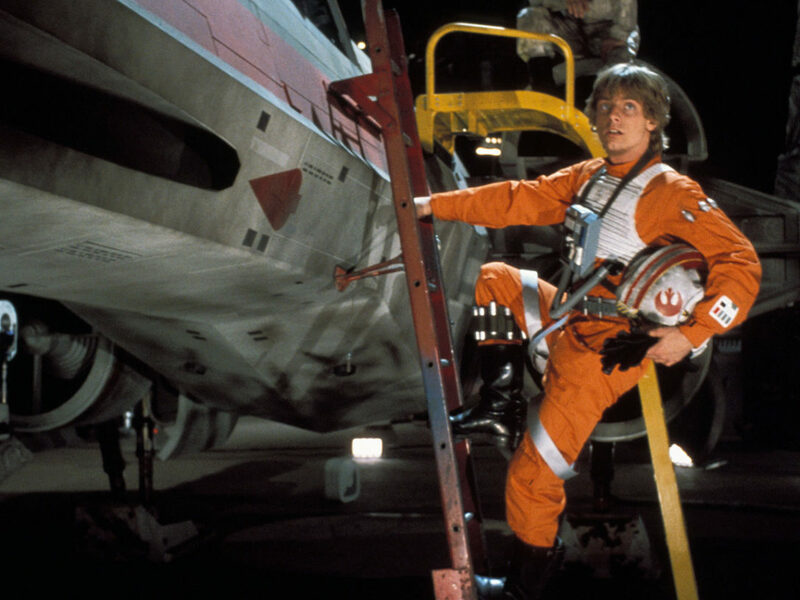 When George Lucas shot the exteriors for Yavin 4 for the 1997 re-release of A New Hope, he found an old dirigible hangar. Chiang visited there and found that it would work perfectly for the same location years later. Inside, they built the interiors of the rebel base and realized that it was more than large enough for their needs, but still weren’t sure there would be enough activity in the base. In order to make the set seem to go on farther, Chiang designed a massive mirror that would double the length of the set, but they did the calculations and found that digitally stretching the sets would be cheaper than crafting a mirror large enough to do the job.